It’s a topic we haven’t been able to get away from since responsive web design came back in vogue a few years ago. Well, today I’m here to tell you that responsive design is great — but it’s a foregone conclusion nowadays that your website is mobile-friendly. As your guests become increasingly mobile-savvy, they’re booking more and more with their mobile phones – making the following studies incredibly pertinent to your business, now and into the future. As a provider of custom vacation rental website solutions, we’re fortunate to have a large sample size of website data (via Google Analytics) at our disposal. For this study, we rounded up 20+ websites and imported their 2015 revenue statistics into a large spreadsheet for a detailed analysis. Below are some of those statistics and the conclusions we were able to draw from them. With this much information to sift through, I knew we were in for a treat after all was said and done. Clearly, the most obvious takeaway from this data is the explosive growth in mobile activity we’ve had this year – which shows no signs of stopping. 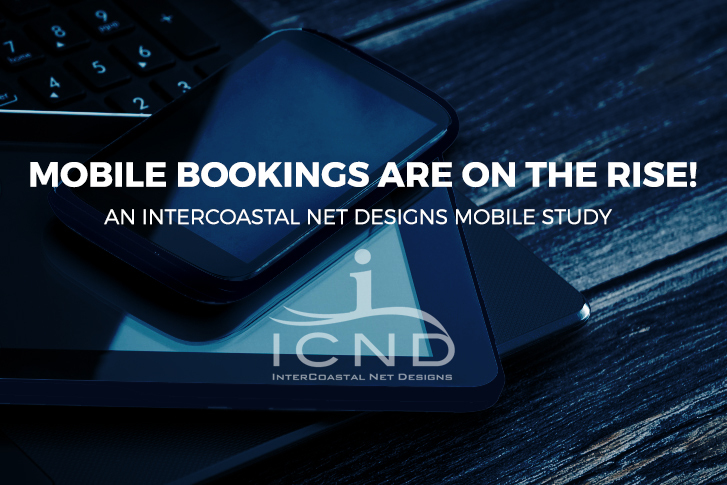 In fact, with a grand total of 1,470,586 mobile visits in 2015 (up 38.43% from last year), mobile sales could very soon rival traditional desktop bookings. That means that in the world of vacation rental marketing, mobile is no longer the little brother of the desktop – it’s more like a jealous twin. But now let’s get into some specifics. Taking into account newfound importance of mobile devices in the vacation rental industry, how can you optimize your site to benefit? One of the strategies that has proven to be the most effective for us here at ICND is the “click-to-call” button. If there is a single governing idea behind boosting conversions in general, it would be to remove confusion. Since the “click-to-call” button gets mobile users on the phone booking their vacations with a single click, it’s achieving exactly that. This is why the strategy has been so successful for us and other vacation rental marketing companies we’ve talked with. When bogged down in the mire of responsive and mobile-friendly discussions, it can be easy to forget that your website isn’t the only asset in need of optimization. Actually, every bit of digital interaction between you and your potential customers must meet the same standards. This includes everything from special event landing pages to emails. Specifically, the links and/or buttons (basically anything that can be clicked on) should be big enough and clear enough to interact with on even the smallest mobile screens. All too frequently, we’ve seen companies equate the two terms “mobile-friendly” and “responsive”. While the two are linked in many ways, there’s a lot more to a mobile-friendly design than simply its responsiveness. For instance, if we keep the “remove confusion” mantra of conversion optimization in mind, several aspects of desktop sites are simply unnecessary for their mobile versions. A good example that pertains specifically to Myrtle Beach vacation rentals is booerealty.com. This page has properties listed underneath a well laid out refine search bar. This makes it easy for potential guests to both view all rentals available, or tailor the results to meet the rental they need. And since the site also provides many Resort and Condo rentals, a user friendly button allows the visitor to jump to browse only these types of rentals. A great example of this would be the sidebar navigation that many desktop sites have in addition to their top bar navigation. This is overkill for a mobile site, and will only serve to confuse your potential guests. But the purpose of this post was actually to present the revealing data we’ve gathered over the last couple years. So, if all this still seems too technical, or you’d simply like the help of a highly-experienced vacation rental marketing company, give us a call or shoot us and email today!